In relations shared by Aquarius and Scorpio, there can be some difficulties and challenges as Scorpio are intense and passionate and respect privacy, while Aquarius are open and out-going and respect independence the most. Aquarius, the Visionary, is ruled by unpredictable Uranus, and by cool, rational Saturn. Scorpio, the Sorcerer, is ruled by passionate, red hot Mars, and by powerful and controlling Pluto. The Sorcerer’s need to control their world (and those in it) will meet its match in the Visionary’s need to be free from any control at all. For Aquarius and Scorpio compatibility to work at its best, Scorpio will need to lose some possessiveness and let Aquarius have his or her freedom – at least, some of it. 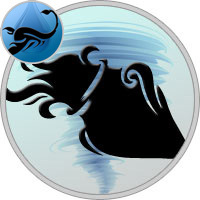 Aquarius, in return, will need to pay more attention to Scorpio’s emotions, and to be less aloof and off-hand with their passionate, soulful mate. If the couple can make the relationship work, this can be a very dignified and respectful partnership. The Scorpio Sorcerer can help the Visionary put some of those progressive plans into action, while the Visionary can help the Sorcerer shake off the bonds of too much emotion and enjoy the lighter side of life. It can be a beautiful balance, but ultimately both of these people are strong characters in their own right, and not necessarily given to balance of any kind. When Scorpio shows too much jealousy, or Aquarius shows too much rebelliousness, the relationship will wobble severely. Can the Sorcerer and the Visionary pull it together? Of course, if they are truly in love. Birthdate compatibility is only a guide, and we humans are know for our capacity to overcome obstacles when in love – so yes, there can be a happily ever after. However, for Aquarius and Scorpio, compatibility will be a difficult prize. Both Aquarius and Scorpio are cut from the same cloth when it comes to getting to the bottom of things especially when it comes to each other. They love delving into the others deepest darkest secrets, or where they should be, to see what they come up with. It makes for an intensely interesting relationship. If secrets are held on one side, the other stops at nothing in figuring out just what those secrets are and vice-versa. With the wild Aquarius and the difficult Scorpio, it really is quite the meeting of the minds. They take ideas and perceptions to a new level. Scorpios are the type that holds a grudge if anyone angers them. Their long memory spans aid in that. Aquarius would hold a grudge too if they could remember why they were so irate to begin with. They typically stay calm and serene and not get angered or even go so far as to let things bother them in the first place. The relationship between Aquarius and Scorpio is usually found to be more successful in a business or family type relationship. Their professional and business relationship is usually good as Aquarius is easy to work with and Scorpio is attentive enough to not let things go out of bounds. As siblings, friends and colleagues also they perform better with each other as their habits and nature does not directly affect each other’s life. As lovers and spouses, there are chances of true clashes which can result in permanent breakup. Even as parents and children their relationship works well especially with Scorpio parents and Aquarius children. Marriage is a beautiful bond of love which happens when the Scorpio lady learns to be more patient with her Aquarius man and he in turn cooperates with his lady to make it a success. Out of the two, it is always the Aquarius man who makes it first move to get the attention of the gorgeous Scorpio lady. She admires his happy-go-luck kind of approach which helps her experience a more relaxed and interesting side of life. He teaches her to be more relaxed, patient and less suspicious which works beautifully in empowering their relationship with more strength. He adds lots of excitement to her life thereby making it a more interesting life. They both learn to dream with each other and become a perfectly balanced couple. She teaches him qualities like self-control and ability to express strongly which helps him deal the tough situations which more patience and act wise when he is just about to lose the cool. With time, they are able to understand the unspoken words and read each other’s thoughts and ideas. They both hold on to each other with one look which does the magic for them. They enjoy living in their world of dreams which is so beautiful and blissful. When he is able to find his freedom and friend in the marriage with the Scorpio lady, he experiences one of the most beautiful associations which help them both unite for life. They are a complementing couple and when they come together they create a strong and stable relationship with their ability to love each other without any conditions.